Busy though I may be, I can’t help but note the death of Eric Hobsbawm and offer a few thoughts. 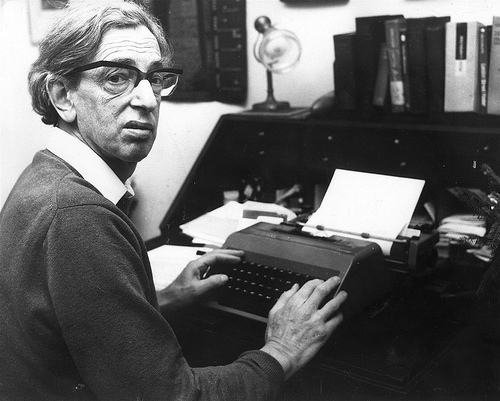 Eric Hobsbawm at his typewriter. Source: John Brown via Jacobin. Rather than recount his fascinating life or delve into his most famous works, I’d like mention how he (unknowingly) touched my life at a couple of important moments. Not long after receiving Uncommon People, perhaps in my first or second year as an undergraduate, I came across his Primitive Rebels (1959) in a used book store. I think this may have been the first time I found a work of history that was not only interesting and politically appealing, but also made an important argument about the nature of past societies. Indeed, the book almost single-handedly created a whole new analytical category: ‘social crime’.⁴ I’m not going to claim it was the light on the road to Damascus that turned me into a budding historian, but in retrospect I think it helped to push me in that direction. It’s no accident that the undergrad module I put together for this year includes a week focusing on the debate that this concept spawned. 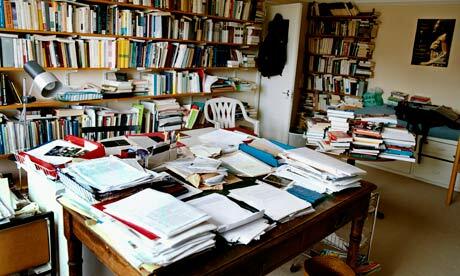 Hobsbawm’s writing room, reassuringly messy. Source: Eamon McCabe via the Gaurdian. And then, many years later, whilst looking around for something to do at the expiration of my fellowship at Cambridge, imagine my delight at being invited for an interview for a post at Birkbeck. Founded in a tavern as the London Mechanics’ Institute back in 1823, this was the place that Hobsbawm made his academic home when become a lecturer there in 1947. He was still its nominal President when I applied there last year and, despite being in his nineties, my colleagues recount vivid memories of him still occasionally strolling into the department to chat and of course frequently showing up at conferences to engage in conversation (and disputation) with historians less than half his age. I am saddened to have never met him myself, but I hope that in some very small way I can help carry on his legacy at this wonderfully unusual institution. I would be very curious to hear how some of the monster’s other heads or perhaps some of our readers encountered Hobsbawm’s work. Does anyone have any stories to share? ¹ See also this nice little collection of quotations from the great man himself. The final one ‘On his writing room’s bookshelves’ is particularly pleasing. ³ Note that this also means, strangely, that I read Hobsbawm before reading E.P. Thompson or Christopher Hill, two other members of the Communist Party Historians Working Group, whose work I cite infinitely more often. ⁴ The Wikipedia article on ‘social bandits’ isn’t bad, but for a more detailed recent discussion, see John Lea, ‘Social Crime Revisited’, Theoretical Criminality, 3:3 (1999) [ungated]. For early modernists, the work on this by Douglas Hay, Peter Linebaugh and E.P. Thompson, especially but not exclusively Albion’s Fatal Tree (1975) and the responses it provoked, is essential reading. This entry was posted in History, Theory and methods and tagged classy history, the craft by Brodie Waddell. Bookmark the permalink. Many thanks for the Lea social crime update (although I don’t find it ungated). But must protest if Hobsbawm’s organized piles of notes/books count as “messy”! Thanks, Newton. The link to Lea should go to http://www.bunker8.pwp.blueyonder.co.uk/misc/socrime.html which doesn’t ask me for a log-in or anything, but apologies if it has snuck beyond a pay-wall. Fair point on Hobsbawm’s writing room. I’ve seen much, much worse. Perhaps ‘crowded’ would be a better term than ‘messy’. Whoops. Found it. Thanks. My soc anth MPhil thesis on smugglers ultimately jettisoned social crime as applicable (for smugglers, law/policing ensures their profit margin). But I would never have gone in that direction without social bandits leading me in the first place. Yeah, I can empathise with that. I have a somewhat similar relationship with E.P. Thompson’s ‘moral economy’ model. I wouldn’t have even started writing my book without it, but I spend most of my criticising it. My first encounter with Eric Hobsbawm’s work came at an important formative phase of my undergraduate training as a historian. I had just started a course with Andy Wood on the social history of early modern England, and was hugely excited by the idea that this course – unlike any history I had studied previously – was going to approach history ‘from below’, exploring the experiences of common men and women in the past. Great, I thought, these are the people that I am descended from, this is my history. At the same time I was starting a course on historiography – called ‘Doing History’, I think – and was swatting up by reading a freshly purchased copy of Richard Evans, In Defence of History. On page 165 (the bookmark is still in there) I was struck by this: ‘under the impact of radical neo-Marxists in Britain, “history from below” has tried to adopt the perspective of ordinary men and women in the past, to write about their experiences and to look on the state, politics and society with their eyes’. As a relatively apolitical 18 year old – if anything my views were closer to my Dad’s working-class Toryism than anything espoused by Marx – I was shocked to discover that I was now a radical neo-Marxist. Concerned that the type of history I had just started to fall for was radical – and possibly, therefore, considered illegitimate by many – I headed to the bookshop to find out more about it. There I came across a copy of Hobsbawm’s collected historiographical essays, On History, including an essay ‘On History from Below’. This was a statement of the importance of such an approach (it was initially a lecture delivered to honour another pioneer in the field, George Rudé). But it was Hobsbawm’s reflective tone, balancing sensitivity to the myriad technical and source-based difficulties that history from below faces with a thoughtful agenda for deciphering what we could recover about ordinary men and women in the past, that reassured me that this was a serious, legitimate and rigorous historical field. If it was good enough for Eric Hobsbawm – whose ‘Age of’ series I had not read but that I knew to be critically acclaimed – I was in. I guess there are other pioneering historians – E.P. Thompson, Keith Wrightson – whose historical research has had a much greater impact on me since, and on whose shoulders I more directly aspire to stand. But it was that key encounter with Hobsbawm’s work as an undergraduate that reassured me these were shoulders worth aiming for. Wonderful story, Mark. As you say, Hobsbawm may have been a radical and he was certainly a Marxist, but he was also a damn good empirical historian. I’m ashamed to say I haven’t read his ‘On History’ yet, but I’ll be grabbing a copy as soon as soon as I bash through my first few weeks of the new term. Thanks for penning this Brodie, it’s extremely sad news, especially following hard on the heels of the death of Eric Ives, one of the giants of twentieth century Tudor history, who was still publishing right up until earlier this year. I first encountered Hobsbawm as a fresh-faced undergraduate at Warwick – his four ‘Ages’ (Revolution, Capital, Empire and Extremes) were core reading for the first-year ‘Making of the Modern World’ option. Probably one of the things I took most from those books is the importance of writing well: as you put so eloquently, this was truly artful historical writing, of the kind to which we should all aspire. As Jonathan says, Hobsbawm was part of the staple diet for Warwick first year undergraduates and I suspect that he remains so to this day – certainly he is recommended reading on Exeter’s first year modern survey module. Of course the problem with that is that it is only later that you come to appreciate the exceptional quality of the writing, and the achievement of those volumes in his astonishing command of his material – how many other books published in the 1970s remain on reading lists up and down the country? Undergraduates really don’t know how lucky they are. Although the great man was perhaps less formative when it comes to our chosen areas of expertise, he is an essential part of our academic training, and scholarly DNA. Thanks, Jonathan and Laura. I’m very pleased to hear Hobsbawm’s work is still shaping young minds, though it’s mildly worrying that texts from the 1960s-80s remain the best introductions to nineteenth-century history. I wonder how long it will take for his place in the undergrad historiography to be superseded? It’s a good question. Given the modern pressures on academics and the very tight deadlines we have for producing publications from our research, it is hard to see how anyone could have the time and intellectual capacity to write a groundbreaking survey monograph, let alone a series of them.